There are times when I know I need a certain set of tabs open in my Chrome browser. For a specific lesson or presentation, I'd like certain things to be open each time I start. TabCloud is my hero in these situations. TabCloud is a Google Chrome Extension that takes all the tabs I have open in my Chrome window and saves them. I can give that tab set a name, and then reopen it on any device I'm logged into that has a full Chrome browser (does not work on iPad, tablet, etc.). Whenever I need that tab set, I can click on the TabCloud icon and load my saved set. It's a beautiful thing. To get TabCloud, head on over to the Chrome Web Store and search for TabCloud (one word). Then click on the blue "Add to Chrome" button. It will ask you for permission - click "Add extension". 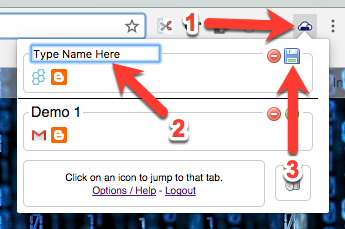 Now you will see the little TabCloud icon in the upper right of your Chrome Browser. The first time you use it will ask you to click to log in, then you will have to allow it access to your account. You should only have to do that once. After that, whenever you have a set of open tabs you'd like to save, click on the cloud, name your set, and click the little disk icon to save it. To load a saved set, click on the TabCloud icon and click the green plus sign next to the set you'd like to load. Then watch the tabs open right before your eyes. 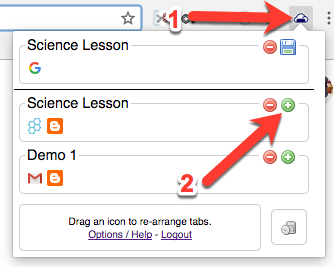 Now when you go to teach a lesson or do a presentation where you need multiple tabs open - the preparation is quick and easy. Walk in, log in, load your saved TabCloud and you are ready to go in just a few clicks.